A successful app is based on three basic ingredients: a good idea, app development skills and a great user interface design. An idea is only the beginning; without the ability to turn that idea into a real app and make it available in the stores, even the best idea is worth nothing. You can either hire the right contractors to design and develop the app – or do it yourself. In both cases, success depends on project management skills: Execution is king! One part of execution is design, which turns the idea into interactions with the user. The user interface design should allow users to achieve their goals in the simplest possible way while at the same time making it a pleasure to use the app. Simplicity, consistency and aesthetics are important factors here. Execution is also development – turning the idea and design into algorithms and code. The code is then compiled into an executable app that can be uploaded to a store and made available to the public. Of course the code must always do what it is supposed to do without bugs or crashes, but it must also be responsive, make use of the underlying platform in the right way and integrate with external services, such as web-based content delivery. 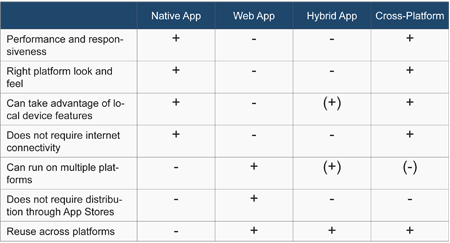 There is a major difference between web apps and the other types: web apps are distributed outside the app stores. This gives you, the developer, more freedom to choose the distribution method, and you don't have to give up 30% of the revenue to the stores. On the other hand, with web apps you don't get the benefit of the app store distribution machine. 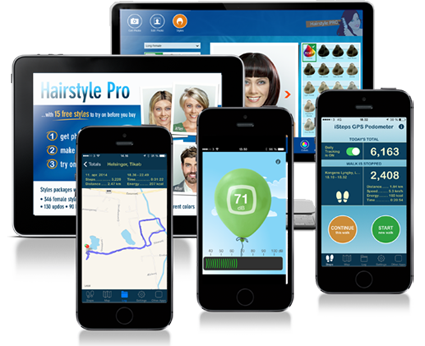 In KBMSOFT we have six years of experience developing native apps for Apple devices, with apps in the App Store from its start in 2008. The apps have all been coded in Objective-C using the Apple development environment, Xcode. We have also developed native apps for Windows. We had a Windows 8 app in Windows Store when it launched in October 2012. This app was written in C# using Visual Studio from Microsoft. We are currently also developing cross-platform apps using the Xamarin toolset. Xamarin combines the most productive development environment, Visual Studio, with the best language available, C#, and allows the result to run on the three major platforms: iOS, Android and Windows. A native app is developed for a particular platform, where the app can take full advantage of all features in device hardware and platform software. Native mobile apps are distributed through app stores and installed locally on the device. Most often native apps are developed using special tools from the platform provider. A web app is not a real application; it's a website producing HTML that is rendered in a browser. The standard browser bar and buttons can be made invisible and a bookmark looking like an app icon can be placed on the home screen giving the illusion of a native app. A hybrid app is a native app containing an embedded browser capable of rendering HTML content from a website. Cross-platform tools exist to give hybrid apps some access to local device features; PhoneGap is such an example. What is a Cross-Platform App? A cross-platform app is a native app developed using cross-platform tools to make it available on multiple platforms. The app is divided into a platform-independent part and platform-specific parts, all written in the same language. It gives the full native experience but avoids the need to develop completely independent apps for each platform. Xamarin is an excellent example of such a cross-platform tool.